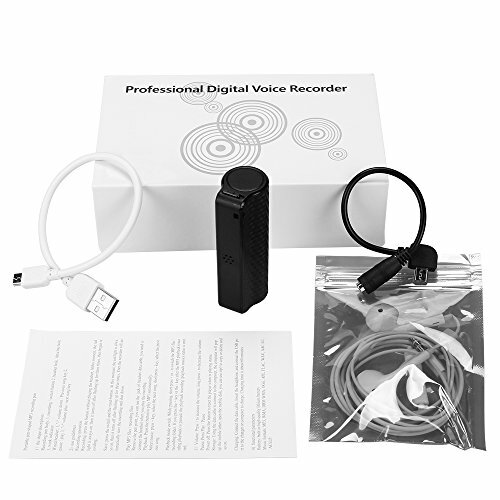 A voice recorder you deserve, voice activated recording, 1000h long time recording, very fashionable appearance for you! This is a 16GB USB flash digital voice recorder with MP3 function. It can record all the sounds it hears. What Are You Waiting For? Get this recorder for your daily life. Voice Activated Recording: Move power button to ON position, it will start recording when sound detected, pause when no sound. Recording/MP3 File: This voice recorder also can as a mp3 player, enjoy music, also can play recordings, switch music and recording files freely by earphone. Well Concealed: Not easy to be found, no sound & no blink when recording and saving, auto saving when battery low. Time-Setting: Save the recording file with a time name, easily know when recorded, just as "20180607081520" which consists of year, month, day, hours, minutes and seconds.